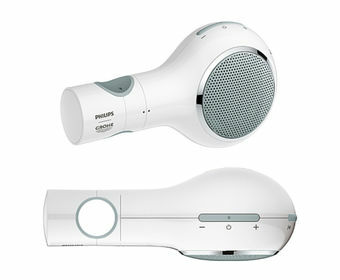 Aquatunes, developed in collaboration with Philips, is a shower speaker that uses Bluetooth wireless technology to stream users’ music. Engineered to be one hundred percent waterproof, the Aquatunes speaker is designed to withstand constant jets of water and can be mounted inside the shower on a slide bar or used as a stand-alone speaker. The Bluetooth range of 25 feet means that the audio source can remain in a distance where it is safe and dry. Its water-resistant induction charging station allows the speaker to operate even during recharging, so the user can enjoy favorite tunes while brushing teeth or applying makeup. Aquatunes is $150 MSRP. F-digital Deluxe is a multi-sensory shower system that stimulates senses and transforms the bathroom into an indulgent space for physical, emotional and spiritual well-being. 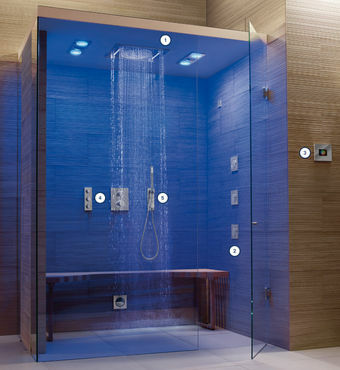 With just one touch, the user can transform the shower into a personal spa, controlling lights, steam and music. F-digital Deluxe starting MRSP is $12,392. GROHE adds to the assortment with luxe products that elevate the kitchen and bath experience. The brand’s K7 and LadyLux3 kitchen faucets—the former, a contemporary statement; the latter, a transitional look—are both available as hands-free options that feature Foot Control Technology, a first-to-market introduction. The clever coup allows the user to switch the water flow on and off with a tap of the foot on the activation plate installed discreetly in the toe space of the cabinet. Ladylux3 Foot Control starting MSRP is $839. K7 Foot Control starting MSRP is $1,239. GROHE Blue Chilled & Sparkling kitchen faucet combines the modern look of a designer faucet with a high-performance filter, cooler and carbonator to offer convenient access to fresh and filtered cool, still or sparkling water at home. The right lever on the faucet is used to mix hot and cold tap water as usual. 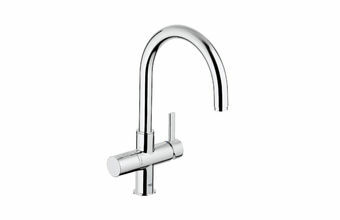 A single turn of the left handle gives you fresh, cooled and two settings for sparkling water in an independent water way. Blue Chilled & Sparkling starting MSRP is $4,299. GROHE SmartControl is a shower system that provides a new level of customization to the shower experience through a double button design allowing the user to control and set all desired shower settings. The textured edges of each button mean the user can easily control water flow, volume and temperature even with wet fingers. Also equipped with GROHE TurboStat technology, SmartControl delivers the user their preferred water temperature within fractions of a second and keeps the temperature consistent throughout the duration of the shower. For added convenience and storage space, the top of the control unit serves as a shelf for bath products and can be detached for easy cleaning. The system is fully customizable – several GROHE showerheads and handshowers can be selected to match the user’s style, preference and price point. SmartControl starting MSRP is $1,195. 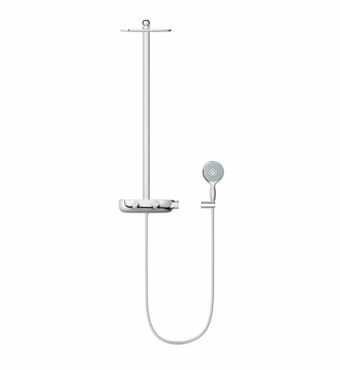 The GROHE Retro-Fit shower system transforms an existing shower into a luxurious, multifunctional shower system with a showerhead and handshower that can be operated simultaneously. The system can be installed in one hour or less without breaking existing tile as it connects to existing plumbing; optional 6" height extension offers an extra solution for most application. 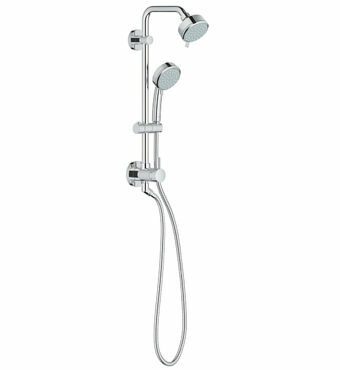 The Retro-Fit shower system is pre-packed with Euphoria showerhead and handshowers or can be tailored to meet the user’s style and budget needs with a variety of compatible showerhead and handshowers at various price points. Retro-Fit starting MSRP is $679. To learn more, visit www.grohe.com/us. GROHE Ladylux3®, GROHE Blue Chilled & Sparkling® , GROHE K7® , GROHE TurboStat are registered trademarks of GROHE AG.